Prominent & Leading Manufacturer from Bhopal, we offer solar dc cooker (24v), solar dc cooker and solar induction cooker. Time to reduce your expenses and save more for the future. 1, More healthy: no radiation, no electromagnetic wave radiation, suitable for pregnant women,old people and children to use. 2, More security: multiple safety protection, prevent overheating & leakage, no fire, waterproof, safe and reliable. Smokeless, no exhaust gas, does not produce carbon monoxide, cooking visible halogen light, make you more easily identify the unit is normal. 3, More useful: any material suitable for fat pan. For example, ceramic pot, pot, stainless steel pot, iron, aluminum, glass pot. 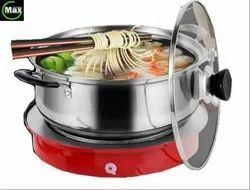 4, More convenient: strong firepower, heat evenly, can make tea, steamed fish, cooking, soup, cooking, frying, barbecue. 1, More healthy: no radiation, no electromagnetic wave radiation, suitable for pregnant women,old people and children to use etc.